Following the 1898 revolution, The Philippines lost its privileged position within the Order and retreated quietly into the background. The Province itself searched anxiously for new fields in Spain and South America. At one time there was a question about the possibility of remaining in the Philippines at all, and giving preference to the new ministries that from 1898 began opening up for its members in Panama, Venezuela and Brazil. In 1906, more than two thirds of its religious lived in these four countries. Cathedral of Shangqiu, Henan, China. By this date, the crisis was already over. Having opened the novitiate and regained a sense of hope, the Province began to look to the future with renewed enthusiasm. This same year, following a visit by the provincial, its commitment to the Philippines was confirmed. But it would no longer be a total commitment. Experience had shown the necessity of diversifying the field of activity, and as a consequence those ministries opened in other countries would continue. The Order was also reorganizing its personnel, and its plans obviously affected those of the Province. 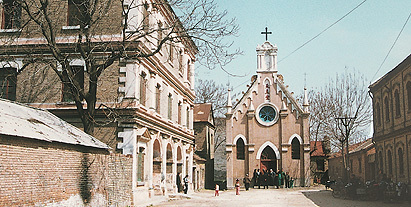 In 1909, the General Curia assigned the ministries in Brazil and the religious houses of Andalusia to the new Province of St Thomas of Villanueva. The following year, those of Tumaco and Panama went to the Candelaria province. St Nicholas province was reduced to the ministries of Venezuela and the Philippines, and the Spanish houses of Monteagudo, Marcilla, San Millan de la Cogolla, and Puente la Reina, in the Navarra and Rioja regions. These ministries, which would be joined by those of China (1907), England (1932), Peru (1939), and Mexico (1941), would form the horizons of the religious until 1948. During the first three decades of the 20th century in the Philippines, the Province focussed almost exclusively on survival, grateful to be able to recover as far as possible what it had had before the Revolution. Almost all the religious worked in parish ministry. This exclusiveness did not make everyone happy, but the Province did not find a worthwhile alternative: there was a lack of imagination, experience, and decisiveness. Both community discipline and pastoral work had known better days. Nevertheless, new signs of hope began to emerge. In 1910 the Holy See entrusted to the Province the first apostolic prefecture in the Philippines, Palawan; in 1924 the long-held dream of joining the mission in China became a reality. The mission of Kweiteh (today Shangqiu, Henan province) achieved particular significance. The Province looked after it with care, serving the mission with self-sacrificing missionaries in considerable numbers. Unfortunately, after the Communists came to power in 1949, foreign missionaries had to leave the country. Nine native religious, together with a few sisters, stayed behind, and they have fertilized the mission with their blood and their heroism. Here you can find the complete history of this Mission. The missionary epic in China also produced one fruit, in the shape of a magazine. Starting in July 1928 the Recollect missionaries in China published the magazine Todos Misioneros (Everyone a Missionary), with the aim of supporting the mission; its editorial staff later moved from China to Manila and subsequently to various places in Spain, until in 1970 the debatable decision was taken to combine forces by merging it with other magazines and the official organ of the Pontifical Mission Societies in the magazine “Missionaries for the Third Millennium”, which is still published. Around 1931, following a painful apostolic visitation, the financial predicament entered into crisis. In 1941 the Province entered into the field of education in expectation of social prestige, economic relief, and, above all, a deeper living-out of the community ideal. Little by little, the colleges began to take the place of the parishes, transforming the Recollect’s activities and even his social profile. In little more than three decades beginning from 1950 the Recollects gave up their banner of missionaries or parish clergy in marginal areas to enter into the world of the completely urban educator. The most significant innovation came in 1949 with the opening of the novitiate in Manila to native vocations. The 1934 chapter had recommended “with implementation” the opening of formation houses in the Philippines, England, and Venezuela. In the Philippines, the recommendation did not come into effect until after the Second World War. It also has to be said that interest in Filipino vocations was only really taken seriously ten years later. If we exclude the one-off ordination of Fr Salvador Calsado in 1945, the first group of Filipinos was not to reach the priesthood until 1959. From this date onwards, both interest in vocations and, naturally enough, their number, increased. By the end of 1997, the Province had 144 professed Filipino religious. The development of the Province in Venezuela took a similar path. Here also, for many years pastoral work took precedence. Its foundations seemed rather provisional, located in areas on the margins and without adequately drawn-up programmes In general terms the work of the friars was very good. The built many churches and chapels, re-establishing worship and Christian life, bringing new life to already-existing associations, and creating new ones. The most common ones were the Apostolate of Prayer, the Daughters of Mary, the Society of St Vincent de Paul, the Confraternity of the Consolation and, above all, catechetical work. It’s also worth underlining the missionary dimension of their work, the preaching of the word of God in the most famous pulpits of the nation, cooperation with the hierarchy, and the generous care of leprosy sufferers in Maracaibo and Caracas. By 1925 the Recollect presence in Venezuela had begun to take new directions. 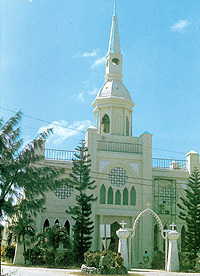 The number of religious was growing, its presence in the cities increased, its particular endeavours were coming to the fore, the broadcast and written apostolates flourished (La Madre Cristiana, 1927 – “The Christian Mother”), the first seminary for local vocations had been established (1935) and Fray Luis de Leon College in Caracas had opened its doors (1941). Here also, the city was replacing the countryside, and educational work was beginning to compete with the traditional monopoly of the parishes. 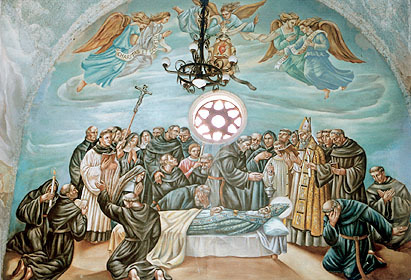 The Death of St. Augustine, Vela Zanetti, San Cristóbal, The Dominican Republic. The foundations in England and in Peru have roots in common. At the beginning of 1932, the anarchy of the Spanish Republic prompted the superiors to seek a religious house outside Spain for the formation of their students, in Ivybridge, Devon, in the South of England. In 1939, fears of political instability in Venezuela took the superiors to Peru in search of somewhere that would be able to welcome the Venezuelan religious, should they have to leave that country. Events soon revealed the wisdom of both courses of action. Between 1932 and 1950, England welcomed several classes of theology students, and from 1934 onwards produced some vocations. In Peru, two groups of theology students found refuge when financial difficulties, caused by the Second World War, prevented their being looked after in Spain. 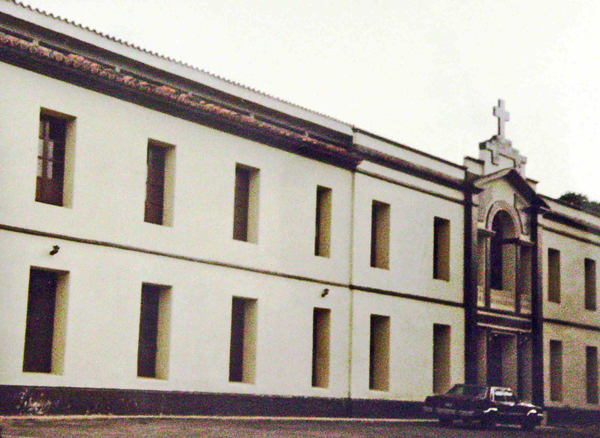 Augustinian Recollect Seminary in Palmira (Táchira), Venezuela, in the 90s. Saint Austin Priory, Ivybridge, Devon, England. 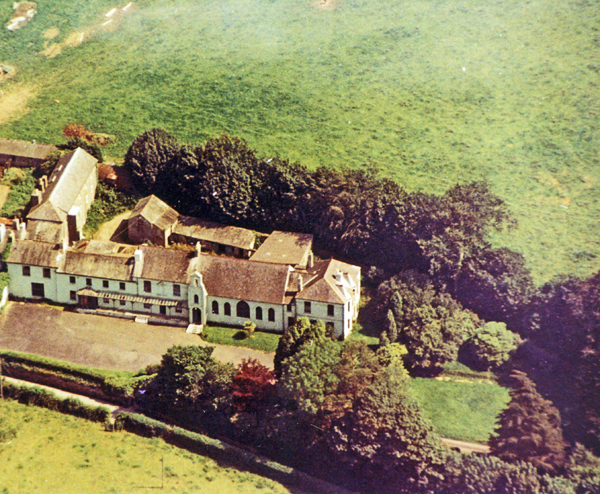 The mother house of the Order in England (1932-2016).